Michael Yon has a classic example of the spectacular-stupidity-and-inflexibility-of-the-TSA genre. “OK,”.I thought. “I have soft hands, but not a bomb.” Notwithstanding such logic, I was informed that I would have to have a full body search. With that two agents escorted me to a private room while other agents began to tear apart my luggage. “That’s him.” replied my interrogator ….. as he proceeded with the full body search. Not quite as bad as the 2002 shakedown of 86-year-old WWII hero and former South Dakota governor Joe Foss, during which TSA personnel failed to recognize and tried to confiscate his Medal of Honor, but very bad. Story here. Hat tip to Amy Alkon. The nincompoops in Norfolk, Va claimed the six shooter design constituted a “replica” and was therefore prohibited. The poor girl missed her flight home to Jacksonville, Fl, and wound up being put on a flight to Orlando. All over a decorative element on a purse. 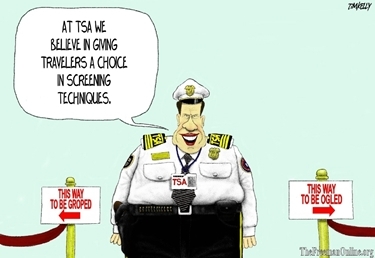 Newt Gingrich ought to start promising to eliminate the TSA. In response to a Department of Homeland Security warning to airlines that it believes terrorists want to bypass full body scanners and blow up commercial airliners by planting bombs inside humans, the TSA has indicated it will intensify security procedures across the nation’s airports. “The Department of Homeland Security has identified a potential threat from terrorists who may be considering surgically implanting explosives or explosive components in humans to conduct terrorist attacks,” an advisory to foreign counterparts notes, according to an unnamed U.S. security official. The advisory says that the DHS believes terrorists could inject a detonating chemical into themselves to trigger the so called “belly bombs”. Officials claim that full body scanners currently being used in airports would not penetrate deep enough to detect such devices. The anonymous official stated that there is no intelligence pointing to a specific plot or that any attack was imminent. The Telegraph has found some alarming information in Wikileaks’ collection of stolen cables. Al-Qaeda is attempting to procure nuclear material and recruit rogue scientists in order to build a radioactive “dirty bomb,” leaked documents published in Wednesday’s Telegraph newspaper revealed. The makeshift nuclear bombs, which could be used against soldiers fighting in Afghanistan, would contaminate the surrounding area for years to come. The leaked documents also revealed that Al-Qaeda papers found in 2007 convinced security officials that “greater advances” had been made in bio-terrorism than was previously feared. The Vancouver Sun mentions a few more details. Security briefings suggest jihadi groups are also close to producing “workable and efficient” biological and chemical weapons that could kill thousands if unleashed in attacks on the West. Thousands of classified American cables obtained by WikiLeaks and passed to the Daily Telegraph detail the international struggle to stop the spread of weapons-grade nuclear, chemical and biological material around the globe. At a NATO meeting in 2009, security chiefs briefed member states that al-Qaida was plotting a program of “dirty radioactive IEDs”, makeshift nuclear roadside bombs that could be used against western troops in Afghanistan. Alerts about the smuggling of nuclear material, sent to Washington from foreign U.S. embassies, document how criminal and terrorist gangs were trafficking large amounts of highly radioactive material across Europe, Africa and the Middle East. And the Telegraph published today the details of a series of nuclear trafficking incidents occurring in recent years. Radiation alarms installed on the border crossing between Uzbekistan and Kazakhstan sounded in November 2007 as a freight train travelling from Kyrgyzstan to Iran passed through Nazarbek rail station. Customs officials halted the train to perform an examination and found that a single carriage ostensibly packed with “scrap metal” was perilously radioactive. So high were the radiation levels that officials were instructed not to pass within five metres of the carriage, making it impossible to come close enough to open it. At the time of the last dispatch to Washington, sent in January 2008, the rail car was still unopened and remained in quarantine. In November 2007, the US embassy in London received a telephone call from a British deep-sea salvage merchant based in Sheffield, who claimed that his business associates in the Philippines had found six uranium “bricks” at the site of an underwater wreck. The uranium had formerly belonged the US. The merchant provided nine photographs of the bricks, which he said his associates wanted to sell for a profit. It is not clear whether diplomats agreed to the purchase. Officials in the US embassy in Uganda were approached in February 2008 by a source who claimed that a Congolese acquaintance had asked him to help find a buyer for some highly enriched pure uranium liquid. The source, a Ugandan gold merchant, said a potential sale to a Pakistani buyer in Kenya had fallen through due to the ongoing civil unrest in the east African county. A nuclear smuggling alert sent back to Washington states that the highly radioactive material may be transported across the Congolese border in Uganda in the next few days by train, bus or taxi. In September 2009, two employees working at the Rossing Uranium Mine in Namibia smuggled almost half a ton of the uranium concentrate powder – known as “yellowcake” – out of the compound in plastic carrier bags. The theft was initiated by Namibian police officers who offered the two employees “exorbitant amounts of money” in a bungled sting designed to determine how easily uranium could be stolen. The two employees removed the yellowcake from a broken drum and scooped it into carrier bags which they placed into a skip and smuggled out of the compound on the back of a haulage truck. The police caught the thieves when they attempted to sell 24 bags containing 170kg (370lb) of the stolen yellowcake. The remaining 250kg was not intercepted and are likely to have been sold on to smugglers. A car carrying three Armenian men set off a radiation detector on the Georgian-Armenian border in August 2009. The driver was waved through by guards after he claimed to have been injected with radioactive isotopes during surgery. When the alarm sounded again as the car returned from Armenia, the guards decided to carry out a search. They found that the car was contaminated with radiation throughout, but no nuclear material was discovered. Whatever radioactive cargo the car may previously have been carrying had already been delivered. A Portuguese man walked into the US embassy in Lisbon in July 2008 offering to sell six uranium plates that had been stolen from Chernobyl – the site of the 1986 nuclear catastrophe in the USSR. The plates were in the possession of an ex-Russian general who was allegedly using a Portuguese judge to broker sales, he said. Officials reported that the source was a well-known “small-time hustler,” known as “The Giraffe” who was involved in “many scams”. The case was referred to the Portuguese police. The Security Service of Ukraine arrested two private entrepreneurs and a prominent local politician in April 2009 as they attempted to sell a container of weapons-grade plutonium for $10 million (£6.3 million) in the western province of Ternopil Oblast. A security official told the embassy that the radioactive material could be “used by terrorists for making a dirty bomb”. During the summer of 2009, Russian customs officers reported three incidents in which cobalt-60, a highly radioactive substance, was detected in passenger trains travelling from Kazakhstan to Russia. A large number of passengers were exposed to the radiation. The authorities seized 500g of the substance. Airport security staff are being urged to examine “children’s articles” after US intelligence concluded that terrorists were plotting to fill them with explosive chemicals. Terrorists are attempting to manufacture nitrocellulose, a chemical which can become highly explosive if tightly packed. Details of how to prepare the chemical, which cannot be detected by airport X-ray machines, have been found in al-Qaeda training manuals. Security forces at Gatwick Airport recently detected an assault rifle concealed in hand luggage and prevented it being smuggled aboard a departing aircraft. The crouching, camouflaged figure is most certainly armed. But few would say he was dangerous. Security officials disagreed however when he passed through a scanner at Gatwick Airport. His three-inch, plastic toy gun was branded a ‘firearm’ and banned from a transatlantic flight. The plastic Royal Signaller was bought by tourist Julie Lloyd as a present to take home to her husband Ken, a recently retired policeman in Toronto, Canada. Mrs Lloyd, 59, who regularly visits Britain to see her mother, said: ‘I took it to the airport still in its wrapping, but they discovered the little gun when it was scanned. ‘It is only about three inches long and there are no moving parts. There isn’t even a trigger. News10 (Sacramento) has a pretty outrageous story of official misbehavior on the part of the authorities. The 50-year-old pilot, who lives outside Sacramento, asked that neither he nor his airline be identified. He has worked for the airline for more than a decade and was deputized by the TSA to carry a gun in the cockpit. 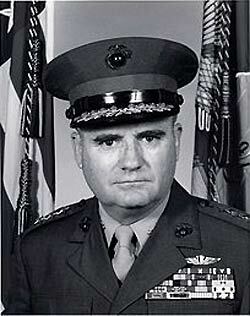 He is also a helicopter test pilot in the Army Reserve and flew missions for the United Nations in Macedonia. Three days after he posted a series of six video clips recorded with a cell phone camera at San Francisco International Airport, four federal air marshals and two sheriff’s deputies arrived at his house to confiscate his federally-issued firearm. The pilot recorded that event as well and provided all the video to News10. At the same time as the federal marshals took the pilot’s gun, a deputy sheriff asked him to surrender his state-issued permit to carry a concealed weapon. A follow-up letter from the sheriff’s department said the CCW permit would be reevaluated following the outcome of the federal investigation. Neither of these news organizations bothered to supply a link to the original video. YouTube searches are not turning it up so far. I’ll keep looking and post it when I find it. Nate Anderson shares a story from a flyers’ forum that occurred in 2009. I’m in line at Terminal E’s main TSA checkpoint at IAH [Houston’s main airport] and there are two gentlemen about 10-12 spots in front of me in line wearing kilts. No one is actually paying them much extra attention (and I have seen men in kilts before at IAH and other US airports) and we all continue toward the belts/bins… One of the “kilted” men was chosen for a random (as he did not alarm) secondary it seems; they had “placed” him into their magic plexiglass cube of indignity to do the pat down. Here is where it gets funny. I wait by the belt and slowly put my shoes on so I can hear and watch some of the fun. The TSOgre says immediately, and I quote EXACTLY, “Why you wearin’ a skirt, bro?” The kilted traveler just kind of stood in a stunned silence. The TSOgre proceeds to pat the front and back of the torso down but then stops at the waist and calls a supervisor. Mister pay band F supervisor shows up and the TSA’s finest continue to chat about how to pat down the lower body. The line lackey TSOgre suggested the gentleman raise his kilt (no, I am not kidding…), to which the band F supervisor actually says, “That is not a good idea”. At this point the other kilted man had put his shoes back on and walked away and I had to go as well. When I left the kilted traveler was laughing and in good spirits. TSA chief John Pistole recently drew the line at cavity searching airline passengers, explaining erroneously to the gaping idiots in the lamestream press that the terrorist would have to be carrying a detectable external detonating mechanism, and our current gropings and electronic strip searchers would find that. Terrorists could, of course, conceal a radio-transmitting detonator in more or less any object. But, why worry about cavity bombs when al Qaeda is being reported to be making plans for surgically-implanted infernal devices. Jihadis bent on concocting a “new kind of terrorism” are brainstorming how to surgically implant explosives to make undetectable Frankenbombers. “What is your opinion about surgeries through which I can implant the bomb …inside the operative’s body?” an apparent mad surgeon recently asked an online forum used by Al Qaeda affiliates. “I am waiting for the interaction of the experienced brothers to connect the two sciences together and produce a new kind of terrorism, Allah willing,” he wrote, according to a translation by terror experts at the SITE Intelligence Group. The scheming comes amid controversy over body scanners and pat-downs in airports that some Americans complain are too invasive. The ideas for a “surgically booby-trapped martyrdom seeker” were chillingly concise for the doctor of death monitored by SITE. Stitching a bomb into the abdominal cavity made of plastic or liquid explosives – such as semtex or PETN – was judged the best method. “It must be planted near the surface of the body, because the human body absorbs shocks,” advised one terrorist. Al Qaeda has already used a remotely detonated cavity bomb in an assassination attempt on the Saudi head of counter-terrorism. Buck Howdy’s song tribute to the TSA. the Archives of Never Yet Melted in the 'Airline Security' Category.